Expressing thanks has been shown to improve our physical, mental, and emotional well-being. When we remember to count our blessings, we are able to more effectively cope with stress, handle adversity, and focus on the positive. As part of our natural development, we are taught to seek validation from others through our behaviors and achievements. Unfortunately, this can often cause us to internalize negativity and judge ourselves harshly when we are met with disapproval. The reality is, we cannot control the thoughts or actions of others, and when we own their comments we are choosing to believe that we are not valuable as individuals. A large part of accepting ourselves for who we are is refusing to dwell on the negativity that life inevitably throws our way. One way to do this is to express our gratitude on a daily basis. Writing in a gratitude journal or making daily gratitude lists has been proven to increase positivity, self-esteem, and happiness. However, saying “thank you” doesn’t only help us as the givers – it also improves the mental health, performance, and sense of value of those on the receiving end. Although saying “thank you” can feel contrived or meaningless – these two little words hold an enormous amount of power. A study published in the Journal of Personality and Social Psychology highlighted the significant impact that saying “thank you” has on people. In the study, researchers asked 69 participants to provide feedback to a fictitious student on his cover letter for a job application. After giving their advice through email, they received a reply asking for more help. However, half of the participants received a thankful reply, while the other half received a neutral reply. 66 percent of the participants that received the thankful reply were willing to provide additional feedback, while only 32 percent of the participants that received the neutral reply were willing to provide further assistance. The next day, these same participants received a second email from another student also asking for help. In this case, 55% of participants that received the thankful reply were willing to help, while only 25% of participants that received the neutral reply were willing to help. The results were clear – the participants who had been thanked were more willing to help than the participants who had not been thanked. 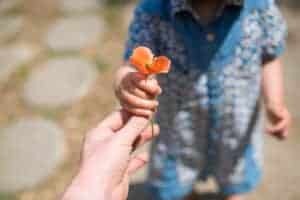 The experimenters believed that the people who received gratitude were more eager to help because they appreciated being needed and felt more socially valued. From a young age we are taught to seek approval and validation from others. However, we live in an impersonal world, and no matter how hard we try, encountering negativity is unavoidable. When we are met with disapproval we judge ourselves harshly, become discouraged, and begin to devalue ourselves. Hearing “thank you” from another member of society assures us that we are valued, boosts our sense of social worth, and motivates us to offer more. Although these two little words don’t always feel like much – expressing gratitude reminds helpers that they are valuable and appreciated, and inspires them to keep helping.